White shirt. "June 7-14 2009, Celebrating 1st Shanghai Pride" in both English and Chinese. Double male symbol. Back: Shanghai Pride 2009. BOB & BOBLelo Lust Objectified. Reproduction and use of this material may require permission from the copyright holder. Please contact the Jean-Nickolaus Tretter Collection in Gay, Lesbian, Bisexual and Transgender Studies for more information. 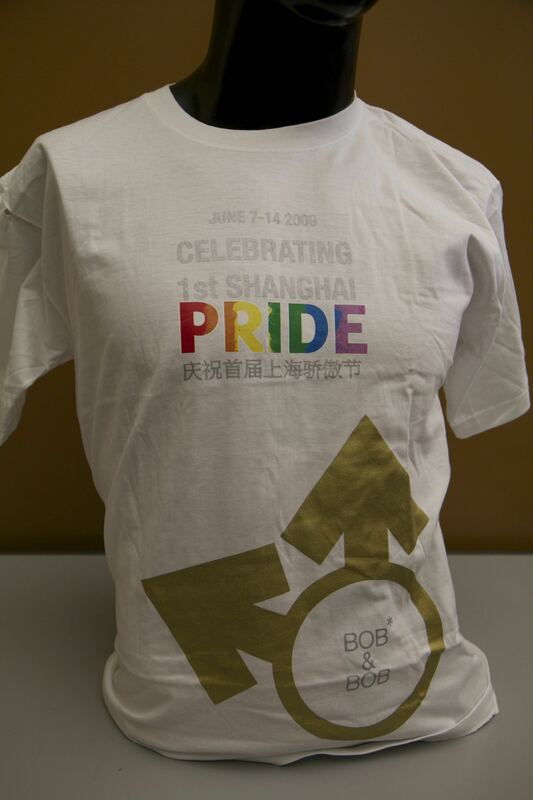 “Shanghai's First Pride (2009),” Wearing Gay History, accessed April 19, 2019, http://wearinggayhistory.com/items/show/1365.